Not for nothing is STIHL TIMBERSPORTS® known as the original extreme sport – this logger sports series is an edge-of-your-seat spectacle, where competitors go head to head with razor sharp axes, two-metre long saws, and super-powered chainsaws cutting through logs nearly half a metre thick! 1. The axes used in the competition are specially designed racing axes that are sharpened by hand. They are so sharp that it is possible to shave with them! Most of the competitors will have several axes to be used with different types of wood. During competitions, athletes will take two axes on stage with them, so that they have a back-up in case one breaks. In a sport where seconds count, no-one wants to have to run off-stage to get another axe, whilst their opponent is smashing through their own log. 2. The competition wood, which is poplar and white pine, is sustainably grown and harvested on certified plantations in Belgium and the Netherlands. They are then peeled so that they are the standard size for competitions and labelled. 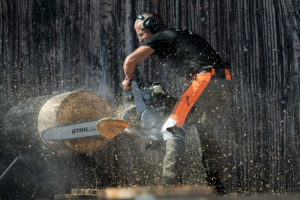 The labelling is important to keep the competition as fair as possible – each competitor is up against someone who is chopping through a log from the same tree as his. After each competition, the remains of the logs are recycled for biomass. 3. The best of the best aren’t always the youngest, although that sometimes helps! Both young and old athletes compete at the top level – in the 2018 Individual World Championship, the competitors ranged from 23 year-old Nathan Cumberland from Canada to nine-time World Champion, Jason Wynyard, who was the oldest athlete at 45 years old. 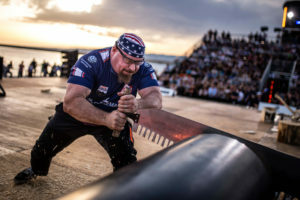 Stamina is useful in TIMBERSPORTS, but experience cannot be underestimated either, as shown when 48 year-old Arden Cogar Jr (pictured) from the US won the right to compete in the 2018 Champions Trophy, finishing in 6thplace overall. Wood-chopping is in the genes for Cogar though, coming from a long line of logger sports legends – his younger cousin, Matt Cogar, took the silver medal in the World Championship last year too. 4. The Hot Saw is the biggest and loudest piece of kit used in the competitions. Hot Saws are specially tuned chainsaws, using engines that are often taken from snowmobile or high-powered motorbikes with up to 80 horsepower. 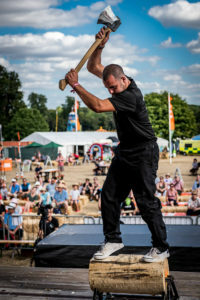 Hot Saws can weigh up to 30 kg, so they are extremely difficult to control, which is where the skill comes in – during the Hot Saw event, athletes have to cut three discs or cookies from a 10cm section of a log within seconds. The World Record for this is 5.20 seconds! 5. 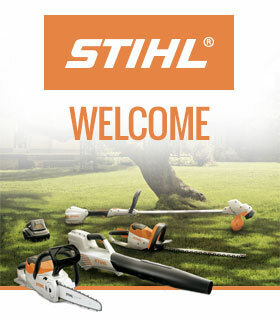 It’s not just for lumberjacks! 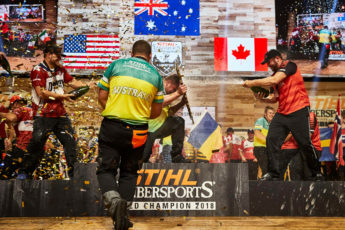 All sorts of people take part in TIMBERSPORTS®, so whilst there are some foresters involved in the sport, there are also builders, farmers, engineers, a graphic designer, a salesman and even a lawyer, in the US TIMBERSPORTS®Series! It’s also not just for the men – we’ve had several women take part in our Newcomers Training Camps here in Great Britain and there are dedicated women’s leagues in some countries around the world. 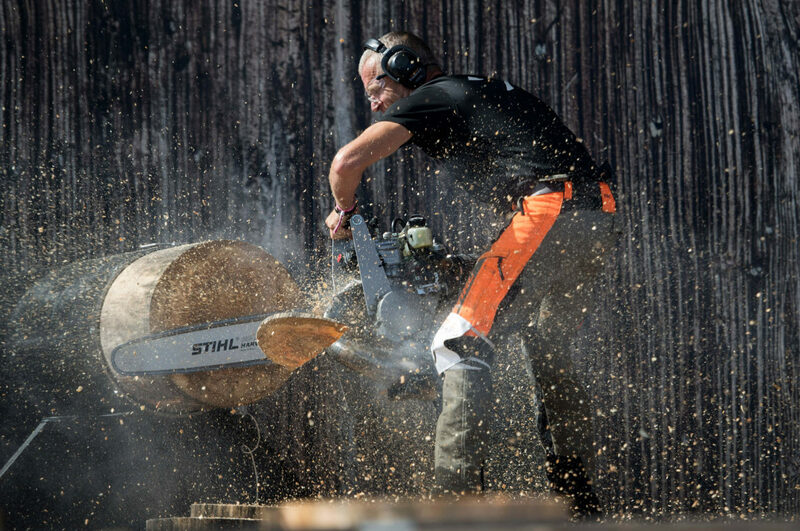 Anyone who is interested in taking part in TIMBERSPORTS®should get in touch with us at timbersports@stihl.co.uk. TIMBERSPORTS® is one of the most exciting sports you’ve never seen! So if this whets your appetite for more axe-treme sport action, the major international events (the Champions Trophy and the World Championship) are both streamed live on the STIHL Facebook page, as is the British Championship in the summer. Follow us on Facebook to make sure you don’t miss out.